For RFI common mode suppression use, mix 31 is effective from 1-300 Mhz, mix 43 works from 25-300 Mhz, Mix 61 is for 200-2000 Mhz, and mix 77 favors .1-50 MHz. These frequencies are those of the interfering signal to be eliminated, not the operating frequencies of the equipment to be protected. See Mix Selection for other applications. 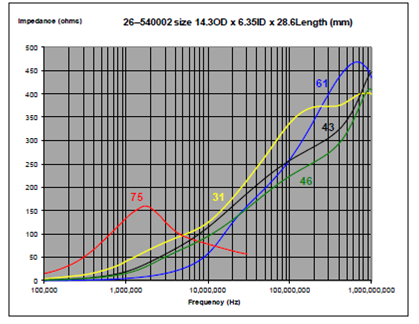 Application Note: Use impedances for each bead at your desired frequency to select number of beads needed for desired Z. For example if you have a 50 ohm RG-8 coax cable and want a choking impedance of 500 ohms at 10 Mhz, you can check the FB102 column (since FB102 will pass RG-8 through its center ID) at 10Mhz and find that Mix 31 has a Z of 108 ohms/bead and Mix 43 has a Z of 91 ohms/bead. 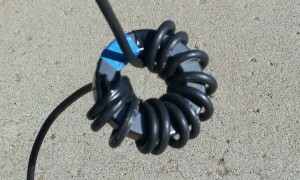 For 500 ohms we would need 5 mix 31 beads or 6 mix 43 beads to have greater than 500 ohms. Mix 31 has better response below 10 Mhz but above 10 Mhz mix 31 and mix 43 are very close. 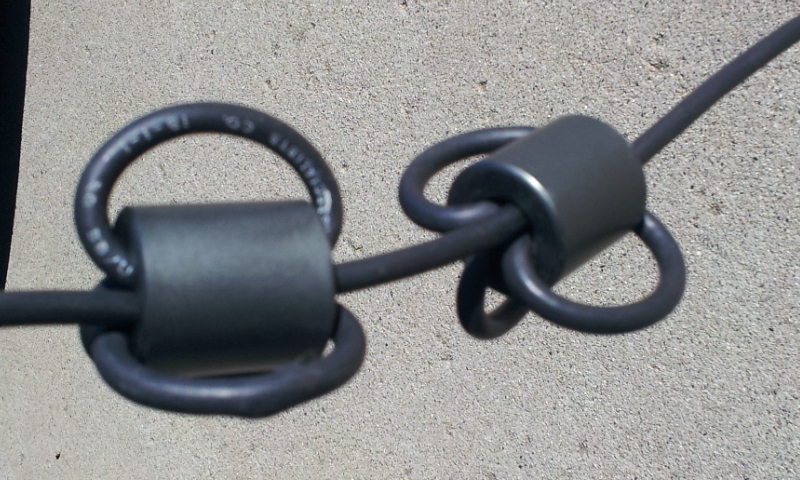 If you need more Z, just use more beads in series on the cable or use more windings thru a larger ID bead (e.g. 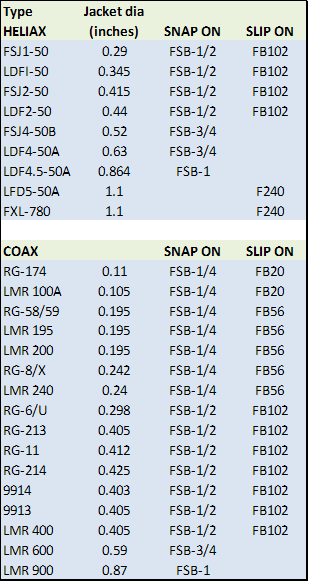 USE FB102-31 for 4 turns of RG-8X for 16X increase in Z per bead – see pictures below for examples). Use Mix 61 for VHF and above for RFI/EMI suppression and below 30 Mhz for multi-ratio impedance transformers (baluns/ununs). See Mix Selection for other applications. For extra large cables use the FB400-31 which has an inside diameter of 3 inches (76mm). Application note for using Slip On or Snap On ferrite beads for RFI/EMI suppression: How many chokes do I need? Shown below in the table are the SLIP ON and SNAP ON products for various popular Heliax and Coax cables. These are the correct size for making sleeve baluns. Here is a simple idea that is cost effective and simple to make using FB102-31 ferrite beads with RG-58 (1/4″) size cable. Take a FB102-31 bead and insert 4 turns of RG58 spreading them out 360 degrees to minimize the capacity effects. 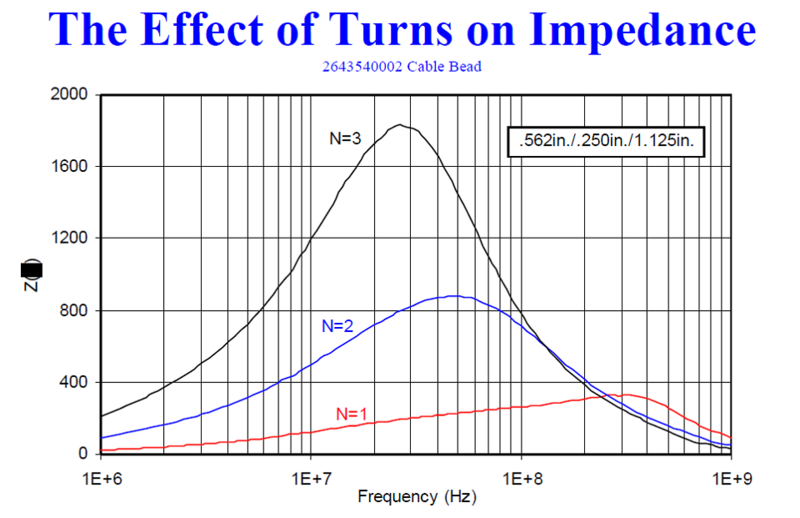 4 turns give 16X the choking impedance of a single bead. So let say you are having a problem with 7 Mhz interference. Typcial choking impedance at 7Mhz for the FB102-31 per the chart above is around 70 ohms for a single turn through the center of the bead. With 4 turns we have 16 x 70 = 1120 ohms and with two chokes on the cable in series we would have 2240 ohms which is pretty good for $11 in beads. See picture below for example of how these beads are used. 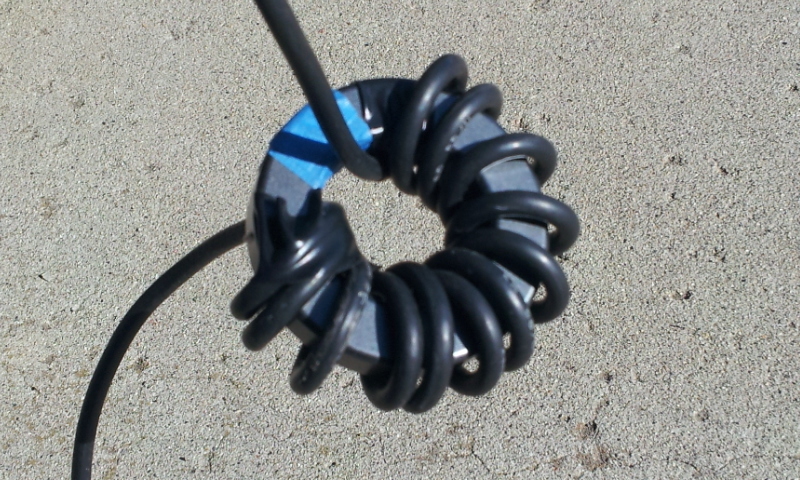 This winding technique is also applicable to FSB-1/2 Snap On Ferrite Split beads which will accommodate 3 turns of RG-58 coax which already has a connector attached. Need even more choking impedance? Use a larger diameter toroid like a FT240-43 (best above 10 Mhz) or 31 mix(best below 10 Mhz) and put 12-14 turns of RG58 on the toroid as shown below. 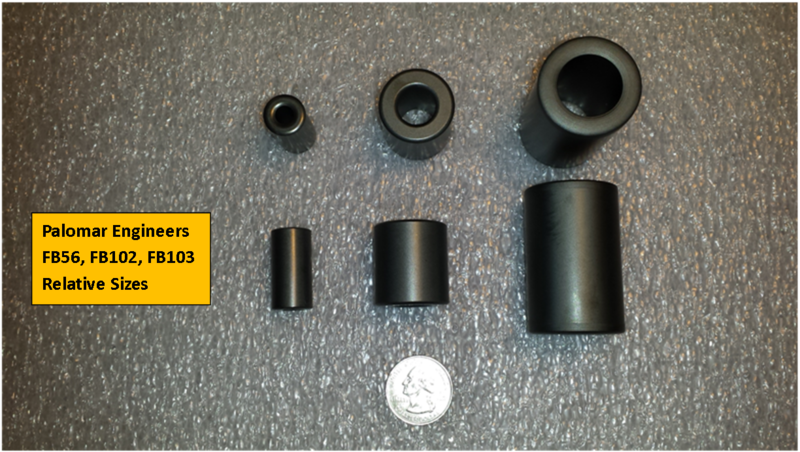 Our Super Choker is very similar to the toroid choke example shown below but uses multiple FT240 toroids and is useful for larger 1/2″ size cable like the RG-213, RG-8, etc. You can order the FB102 beads and the FT-240-31 from info on this page and the FT-240-43 on the Ferrite Toroid Cores page. Got a question about using ferrites? Drop us an email at Sales@Palomar-Engineers.com and we will be glad to answer your question. Connector already on cable? See Snap On Ferrite Beads for convenient installation on cables with connector already installed.